The large plate creates an even platform and at the same time serves as an adapter for baskets, top cases and bags. 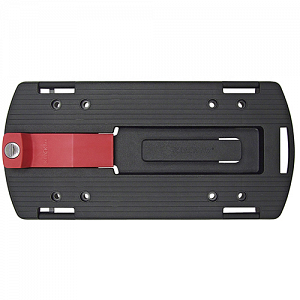 All accessories can be locked through a central bar, easy to release by pressing the red button. Fix boxes, baskets or top cases (with coupling at the bottom) in the middle of the adapter. Bags can be hung into the side slits. The GTA adapter can be mounted with two brackets onto carriers (up to 14,5cm in width).